The edible dormouse (Glis glis) is an example of a mammal with anticipatory reproduction, the mechanism by which animals increase reproductive output before pulsing resources become available, to provide offspring with the maximum abundance of food. In Central Europe, the main pulsing food resources for the edible dormouse are seeds of the European beech and oak. In this location, spermatogenesis occurs only in mast years and most probably depends on the number of beech flowers and buds. 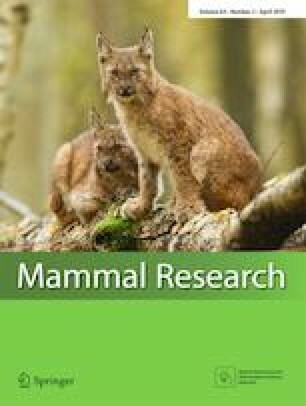 The purpose of the study was to determine the mechanism of reproductive regulation of the dormouse in the Zhiguli Mountains (Russia), which are on the eastern periphery of the dormouse range and outside that of beech trees. The main food of dormice here are acorns, hazelnuts, birch seeds and mushrooms, rather than beech seeds. In years, when there is a shortage of acorns, these are replaced by birch seeds and mass resorption of edible dormouse embryos also occurs. Analyses of diet, environmental condition and reproductive success demonstrated that in unfavourable years, the overwhelming majority of females resorb embryos. In consequence, juveniles are born only once in every 2 to 3 years, despite annual mating and pregnancy of most females. Resorption of embryos is observed in most species of mammals under the influence of strong negative factors and usually affects only some of the embryos, whereas in this dormouse population the process exhibits a regular, synchronous pattern and becomes the primary factor of natality regulation. These findings suggest that mass resorption of embryos might be a common regulatory mechanism of reproduction under pulsing food resources. The online version of this article ( https://doi.org/10.1007/s13364-019-00425-6) contains supplementary material, which is available to authorized users. The author is grateful to Roger Trout and Anna Ayrapetyants for editing, Svetlana Stepanova for help with fieldwork, Irina Dyuzhaeva and Lyudmila Kavelenova for help in the nutrition analysis, Tatyana Chap for the data on fructification of trees, Varvara Egorova for the preparing of maps and Vladimir Vekhnik for help in all stages of work. The author is grateful to the Editor-in-chef Dr. Karol Zub for his inestimable help in statistical analysis and preparing the manuscript and Jerry Hermann for improving the English. The author also thanks the anonymous reviewers for their considerable help in improving the manuscript. This study was funded by the Russian Foundation for basic researches and Samara Oblast according to the research projects nos. 09-04-09387 and 17-44-630288.